Although GoNoodle.com does not contain any advertisements, ad blocking extensions like AdBlock and AdBlock Plus often interfere with our content and may prevent videos from playing. A pop-up window will appear when our system detects software that may interfere with GoNoodle functioning properly. Follow the instructions below to disable AdBlock Plus and AdBlock. Other software may also prompt this window to appear. Follow instructions for that software to disable. Different blockers may look slightly different in different browsers. Look for an icon of a stop sign or a hand, often on a red background, typically to the left or right of the address bar in your browser. 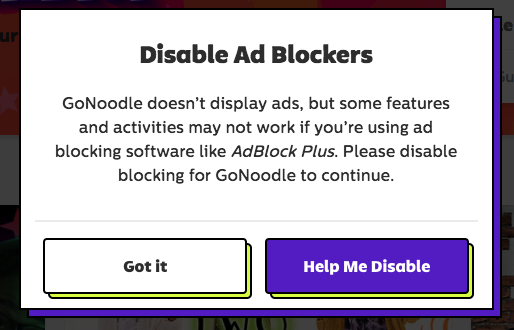 To allow GoNoodle on AdBlock Plus, click Enabled on this site to switch to Disabled on this site. Then refresh the page. To allow GoNoodle on AdBlock, click the hand icon, then click Don't run on pages on this domain. Click Exclude on the pop-up that appears. Then refresh the page. The phrasing differs depending on your browser or the program you are using but will say something like "Do not run on pages on this domain", "Disable on GoNoodle.com", or may just require unchecking "Enabled on this site." If done while on GoNoodle.com, this will allow AdBlock to remain active on your browser for every site but GoNoodle. Note: Be sure to refresh the page once you've changed your AdBlocker's settings. The error message should disappear, and you'll be able to play GoNoodle activities.